Well, Food Bank friends, it’s official. The holiday season is upon us. 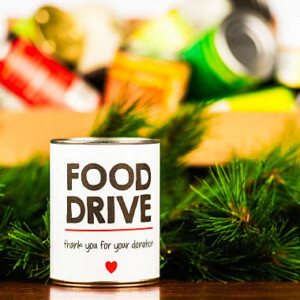 With the holidays comes the annual holiday food drive season. We are so thankful for the fact that so many businesses and organizations think of our neighbors in need during this season and come together to help raise food and funds to make this work possible. We also love to see the fantastic ways they come up with to thank YOU for donating to their drives. Check out these great offers from some of this year’s food drive hosts, and be sure to check back from time to time for updates. The Second Judicial District Court -Washoe County Law Library will waive overdue book fines with a donation of one item per book of non-perishable food. Donations must be made at the Law Library to have the fee waived. Ornament Food Drive: Trade food for a handmade ceramic ornament!? We will have a tree set up decorated with ornaments made by studio members. Barrels from the Food Bank of Northern Nevada will be set up to accept approved food donations. Come in any time before, during or after our event to donate food and pick out an ornament. All participants will be entered into a drawing for a Wal-Mart gift card or Goodie Basket. Player’s card holders will receive 25 bonus entries into the Holly Days Drawings with 2 donated canned food items.